June 13 we will have Dr. Jamie Ellis from the University of Florida as our special guest speaker. Dr. Ellis is a nationally know beekeeper, the head of Entomology at UoF, and a regular contributor to American Bee Journal magazine. He will be speaking to our club for 2 hours with a 20 minute break in between so get to Oatland by 6:00. We will be having a special raffle (super charged with amazing stuff, including a complete hive) so that we can continue to bring in speakers like Dr. Ellis and Dr. Delaplane. If you have anything you would like to donate (hive tools, gift cards, something about bees you have never used) all will be greatly appreciated. Put it on your calendar. June 13: Oatland Island. Dr. Jamie Ellis. BIO – Dr. Ellis joined the Entomology and Nematology department at the University of Florida in August, 2006. 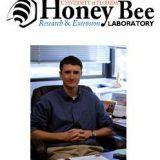 His broad research interests include pollination ecology of honey bees and native bees, varroa mite control, honey bee pathology/parasitology, honey bee nutrition, honey bee chemical ecology, sublethal effects of chemicals on bees, and general honey bee behavior/ecology. There are several research projects currently going on at the HBREL which you can learn more about by clicking the “research” link. Dr. Ellis was promoted to an Associate Professor of Entomology in 2012.